When people think of dieting, often they envision themselves munching on a plain piece of celery...and shudder. I think celery has gotten a bad rap. Yes, it's true that celery is low-calorie, low-sodium, cholesterol-free, and fat-free, hence the saying that it takes more calories to eat celery than it contains. But celery certainly is not taste-free or boring. 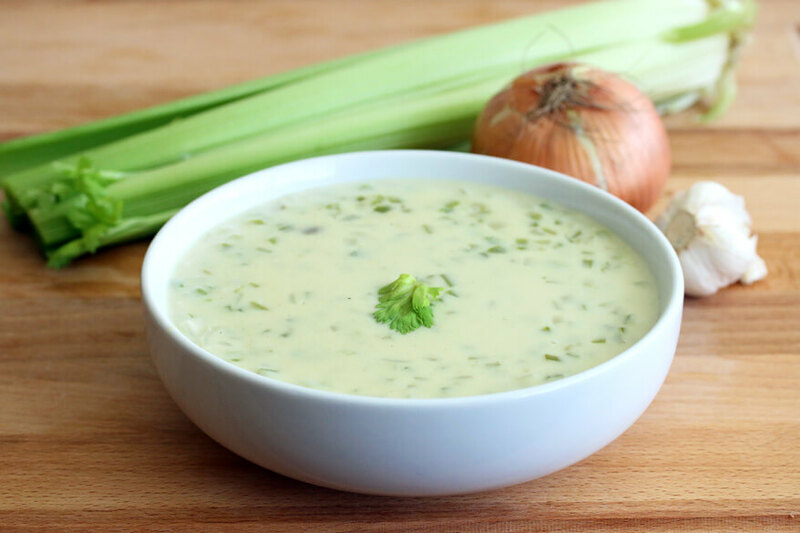 Aside from giving wonderful flavor to soups, stews, casseroles, and salads and being an essential ingredient in mirepoix (an aromatic mixture used as a flavoring base for many dishes), celery has nutritional benefits and medicinal uses as well. Two medium ribs of celery (a rib is a single piece of celery; a stalk is the whole bunch) contains 25 calories, 125mg sodium, 5g carbohydrate, 2g dietary fiber, and 1g protein. Of the U.S. recommended daily allowance, they contain 2% vitamin A, 4% calcium, 10-15% vitamin C, 10% potassium, and 2% iron. Celery is a hepatic, which means it benefits the liver. A healthy liver is vital because it affects how the entire body functions. Therefore, any food that works as a hepatic is held in high regard. Hepatics improve overall liver function, sometimes increasing the flow of bile, and detoxify the liver. Women with poor liver function generally have more PMS, hormonal imbalance, and problems during menopause and perimenopause than women who have healthy liver function. Celery is also considered a carminative, meaning that it soothes the stomach, eases pain, and reduces the production of gas. It is also an antirheumatic, anti-inflammatory, antispasmodic, urinary antiseptic, nervine, and diuretic. What this means is that it helps treat arthritis, gout, and rheumatism, especially rheumatoid arthritis connected with depression. People suffering bouts of hysteria have been given celery seed tonic with apparent success, since it acts as a nerve tonic. It has been noted that celery helps reduce symptoms of Alzheimer's Disease. It has been recommended that a combination of celery, carrot, and prune juices is helpful to those living with the disease. Additionally, celery is good for the kidneys and the digestive system; specifically, it helps relieve gas and indigestion. It also enhances the appetite, which is beneficial to people suffering from diseases which diminish the appetite, such as AIDS. Celery contains a compound called phthalide, which helps lower blood pressure. In aromatherapy, celery is used to promote restful sleep. Celery juice is a known stress reducer. The ancient Romans believed that wearing a crown of celery helped ward off a hangover after a hard night of partying. 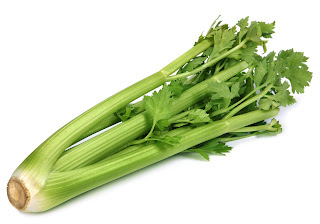 And if you're wondering why celery is served with Bloody Marys, it's because celery improves the taste of tomato juice. Celery Root—This rather ugly, knobby, brown-skinned vegetable—is actually the root of a special celery cultivated specifically for its root. It's also called celeriac and celery knob. 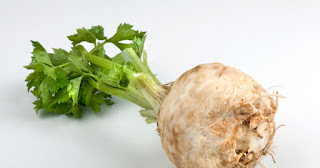 You can get the same benefits from celery root as from "regular" celery. Celery seeds are more often used for medicinal purposes than celery itself, but all three products provide basically the same positive effects. Celery should be even-colored and unblemished. The ribs should have thin veins (the strings that you pull off). The outer stalk should not be too dark, nor should it be white. They should be firm and crisp when snapped. They should not bend easily, be soft, or be cracked. Leaves should be bright green and fresh-looking, not yellow or brown and not wilting. Scratch the root of the celery with your fingernail; the smell should be sweet, not bitter. You can revive wilting celery by cutting off the root end and sticking the ribs in a jar of water and refrigerating them; they will perk up again. Store celery away from tomatoes and apples. These fruits produce ethylene gas, to which celery is particularly sensitive. To use celery, cut off any brown or wilted parts. Trim off the very bottom or the root end and remove the tough outer layer, either by cutting off the top and pulling the strings downward or with a vegetable peeler. (As you get further into the center of the stalk, where the ribs are pale yellow, trimming is not necessary.) The leaves are edible. Chop and use celery in any type of dish. Or, for maximum benefit, juice it. To use celeriac, remove the skin with a vegetable peeler, chop, and use as you would celery. To use the seeds, sprinkle them into food or make an infusion by placing l-2 teaspoonfuls of freshly crushed seeds into the bottom of a cup and pouring a cup of boiling water onto them. Let them steep for l0-l5 minutes. Below are two recipes utilizing fresh, delicious celery. Pour soup into large saucepan. Add cream; bring to simmer, stirring often. Thin with more broth if necessary. Season with salt and pepper. Ladle into bowls. Serves 6. 1. Separate the stalks of the celery from the center and with a sharp knife, string the tougher outside stalks. 2. Then cut the celery into 1-inch lengths. 3. Heat a wok or large saute pan until it is hot. 4. Add the oil, salt and garlic and stir-fry for 20 seconds. 5. 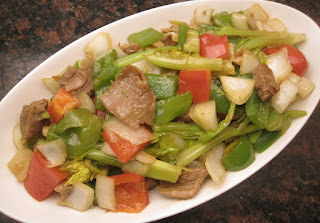 Pour in the celery and continue to stir-fry 2 minutes. 6. Finally, pour in the chicken stock and continue to cook until most of the liquid has evaporated. Serve at once. Serves 4, as part of a Chinese meal or 2, as a single dish.